A while back, Gail and I went to the Nashville Symphony with our daughter, Mary, and her husband, Chris. Mary had bought tickets for Gail’s birthday. It was a magnificent evening. The orchestra was conducted by the renowned Hugh Wolff. He and the orchestra performed Beethoven’s Concerto No. 4 in G major for Piano and Orchestra. Horacio Guitiérrez played the piano. After the intermission, the orchestra performed Rachmaninoff’s Symphonic Dances, Op. 45. The conductor recruits the best players. Great conductors attract great players. Mediocre conductors attract mediocre players. The very best players want to work for the very best conductors. Like attracts like. The conductor is visible, so everyone can see him. The conductor stands on a platform, so that every single member of the orchestra can see him. This is the only way the orchestra can stay in alignment, with each player starting and stopping at the appropriate time. The conductor delegates and focuses on what only he can do. The conductor doesn’t do everything. He doesn’t sell the tickets. He doesn’t participate (usually) in the preliminaries. He doesn’t even make sure that the orchestra is in tune. (The concertmaster does that.) He stays off stage until it is time for him to do what only he can do—lead. The conductor is aware of his gestures and their impact. A conductor can’t afford to make an unintentional gesture. Everything means something. The flick of the wrist, the raising of an eyebrow, and the closing of the eyes all have meaning. A good conductor can’t afford to be careless with his public demeanor. The conductor keeps his back to the audience. Conductors are aware of the audience but their focus is on the the players and their performance. The only time the conductor stops to acknowledge the audience is before the playing begins and after it is finished. Other than that, he is focused on delivering an outstanding product. The conductor shares the spotlight. When the concert is over, and the audience is clapping, the conductor turns to the audience and takes a bow. A good conductor immediately turns to the orchestra and invites them to stand and bow as well. He shares the glory with his colleagues, realizing that without them, the music would not be possible. All of this has direct and immediate application to those of who lead. You might consider attending a symphony with your team and then discussing the implications for how you lead your organization. Question: How do these items relate to leadership? 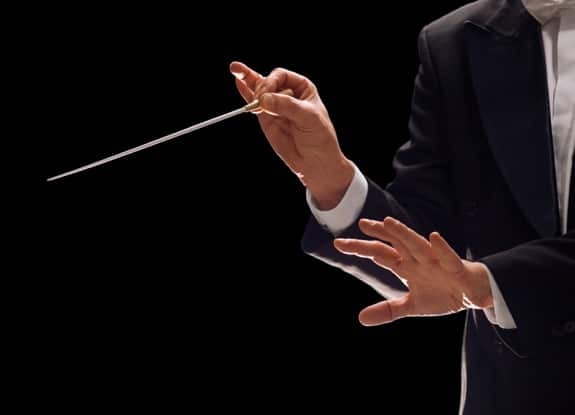 What else can we learn from conductors? You can leave a comment by clicking here.